Billie Jean King (born in Long Beach, California) is a famous Athlete from USA, she is 75 years old and still alive, born November 22, 1943. Billie Jean Moffitt King is a former American tennis player. 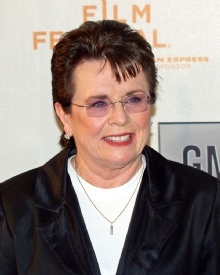 Billie Jean King is primarily known as an exceptionally talented tennis player but also as a temperamental and tireless advocate for women's rights on and off the tennis court. She was a professional tennis player in 1968. When she came to play a crucial role in the creation of a professional tour for women's tennis (WTA later), separately from the men. This also led to a sharp increase in cash prizes for female players. She therefore considered as one of the founders of the WTA, which in 2005 administers 62 tournaments including the Federation Cup and Grand Slam tournaments. A period she was also president of the WTA. In 1973, she defeated the 55-year-old pro player Bobby Riggs in what was called "battle of the sexes." She won the televised game, which received considerable attention, with a set of digits 6-4, 6-3, 6-3. The victory is considered to have been of great importance when it comes to women's sports increased attention. She is born under the zodiac sagittarius, who is known for Philosophical, Motion, Experimentation, Optimism. Our collection contains 44 quotes who is written / told by Billie, under the main topic Sports. "Women get the attention when we get into the men's arena, and that's sad"
"Men can have a huge turnover of sponsorship and still survive a lot better than the women. But the women's ratings are better, at least at home in the United States than in the men's tennis"
"It is very hard to be a female leader. While it is assumed that any man, no matter how tough, has a soft side... and female leader is assumed to be one-dimensional"
"When we reach the point where the women athletes are getting their pick of dates just as easily as the men athletes, then we've really and truly arrived. Parity at last!" "If your partner wants to be private, you have to respect that"
"I will tell you King's First Law of Recognition: You never get it when you want it, and then when it comes, you get too much"
"Ever since that day when I was 11 years old, and I wasn't allowed in a photo because I wasn't wearing a tennis skirt, I knew that I wanted to change the sport"
"Be bold. If you're going to make an error, make a doozy, and don't be afraid to hit the ball"
"There is no life for girls in team sports past Little League. I got into tennis when I realized this, and because I thought golf would be too slow for me, and I was too scared to swim"
"That is where the power, opportunity, and choice come from-when you have money. Money equals opportunity. There is no question"
"In 1973, a woman could not get a credit card without her husband or father or a male signing off on it"
"I like putting money back into what made my life, and tennis has been great to me"
"I didn't really care if I had a coach that much, me personally, because I was brought up to think for myself"
"At 62 you want to keep moving; that's important"
"Victory is fleeting. Losing is forever"
"They're not put on earth to be martyrs; they have to want to come out. It depends on your culture, where you work, where you live. Each person's circumstances are unique"
"The main thing is to care. Care very hard, even if it is only a game you are playing"
"I used to be told if I talked about my sexuality in any way that we wouldn't have a tennis tour"
"I love to promote our sport. I love grass-roots tennis. I love coaching. I love all parts of the sport. I love the business side"
"I knew after my first lesson what I wanted to do with my life"
"I have a lot to say, and if I'm not No. 1, I can't say it"
"I always wanted to help make tennis a team sport"
"When I was outed, it was like, That's done"
"In 1973, women got 59 cents on the dollar; now we are getting 74 cents on the dollar. In the area of finance and business, we are at 68 cents on the dollar"
"I wanted to use sports for social change"
"I think self-awareness is probably the most important thing towards being a champion"
"I think it's impossible to judge whether another person should come out. You just hope they will on their own time and their own terms"
"Everyone has people in their lives that are gay, lesbian or transgender or bisexual. They may not want to admit it, but I guarantee they know somebody"
"Any therapist will tell you that when you're ready, you will come out. To be outed means you weren't ready"
"Women's sports is still in its infancy. The beginning of women's sports in the United States started in 1972, with the passage of Title 9 for girls to finally get athletic scholarships"
"The old boy network is still very strong and very true. Just look at the stock exchange and how many men and women are there. It is still very much run by men"
"In the seventies we had to make it acceptable for people to accept girls and women as athletes. We had to make it okay for them to be active. Those were much scarier times for females in sports"
"I would love to be a player today. I had the right personality for it"
"I would just never out anybody. I think everyone has to find it in their own way and their own time"
"I always liked co-ed events best so we have two men and two women on each team"
"When they take surveys of women in business, of the Fortune 500, the successful women, 80% of them, say they were in sports as a young woman"
"I think younger players probably just think they are who they are-they don't think about coming out. Unless you're number one in the world, nobody cares, usually"
"No one changes the world who isn't obsessed"
"I was always in the tennis business-from 1968. I was in tournaments and also on World Team Tennis teams as well"
"I like entrepreneurial people; I like people who take risks"
"A girl didn't get an athletic scholarship until the fall of 1972 for the very first time"
"A champion is afraid of losing. Everyone else is afraid of winning"